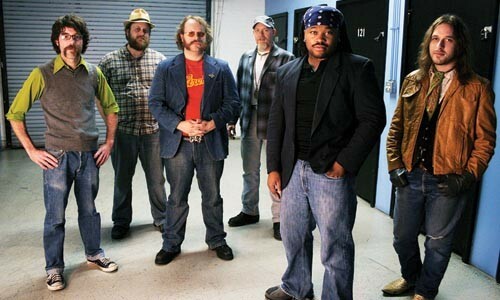 When The Velcro Lewis Group began nearly a decade ago (as Velcro Lewis & His 100 Proof Band), we were in the midst of a blues-rock revival. But what the Chicago outfit offers is much more varied, more comprehensive, more ... well, weird than what most bands that were playing electric roots music in the early '00s created. And while that may explain why few outside of Chicagoland have heard of them, it may also be why Velcro Lewis is still innovating in fresh ways on the cusp of the next decade. The Velcro Lewis Group, with a full-length and an EP under its belt and a reputation for an electrifying live show, has just released a new 7-inch single. The A-side, "Fall to Pieces," exhibits Four Tops-style urgency with a touch of Captain Beefheart's over-the-top growl; "Half a Man," the flip side, recalls Southern rock -- like a more gutsy, less vain Allman Brothers tune. In addition to his caterwauls, the band's legally blind frontman Velcro Lewis (né Andy Slater) plays an electric diddley bow, a rudimentary one-string guitar that adds to the caveman feel of much of the band's primordial rock. In addition to a four-piece band replete with synths and the usual rhythm section, Lewis is backed by Lawrence Peters (of Plastic Crimewave Sound) on, among other instruments, an electric washboard.